Yet, one dog exists whose day is every day! 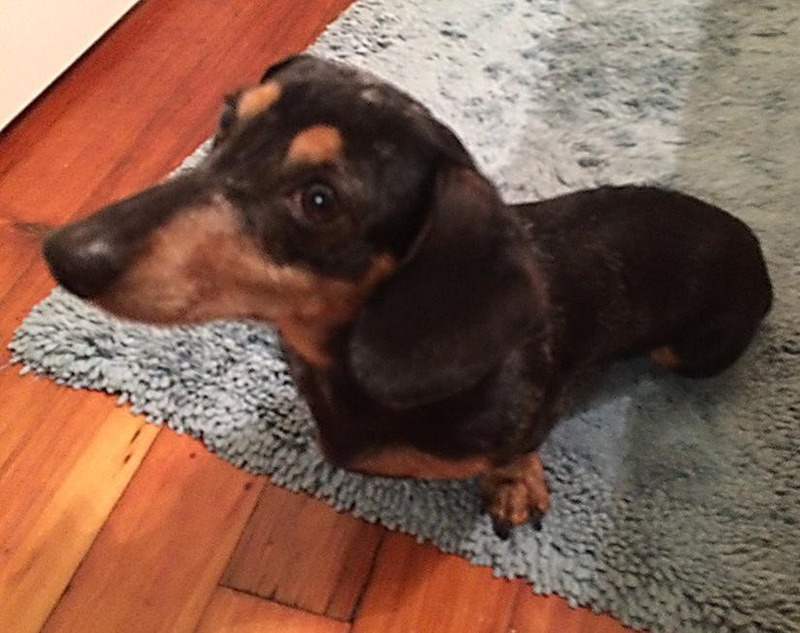 She is Maggie Johnston, an adorable black-and-tan dachshund with a pair of doe-brown eyes and a loving nature who steals the heart of anyone who pets her. Although Maggie is a differently abled pup, she rarely slows down. She inspires everyone, regardless of species, to overcome their hurdles and be the best they can be. She is truly a Positiva Diva! Maggie is a pup on a mission, determined to support her community, her passion for fashion, and her family. Maggie lives in a cozy home in Newnan, Georgia with her Mom, Angela, and her Aunt Becky. She wanted to create a space in her heart for a new dog, but she was still too full of pain to make room. Therefore, she did her best to be patient, and let the right dog find her. Her journey was long, and it took her to many rescue dogs. Angela was unable to adopt one dog because the shelter had taken too much time getting back to her. Another dog was adopted merely a split second before Angela had the chance to say, “Yes!” Yet, the saddest dog was one who she drove many miles to pick up, only to have him die of myelomalacia in her arms. Angela’s heart shattered, and she had almost given up hope finding a dog to adopt. But hope hadn’t given up on Angela. A few months later, on a Saturday morning, she was checking her Facebook page to catch up on the latest news. 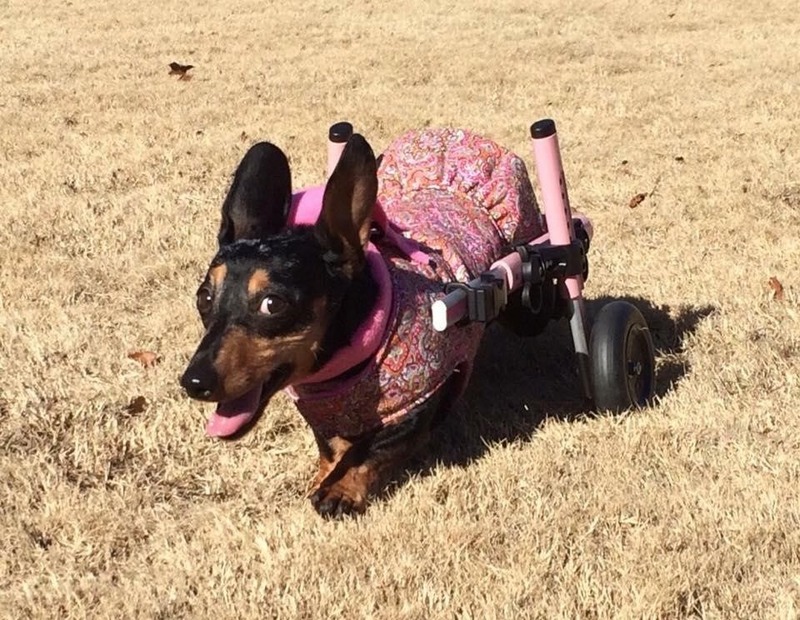 She looked at her favorite dachshund pages and one particular post caught her eye: a fellow wheelie dachshund adopter was struggling with putting her pup to sleep. Angela empathized, and shared her story of Skippy to the poster. She hunched over in bed, her tears making rivers on her face as she typed with trembling fingers on the little telephone keys. She had held in her sadness for so long, it burst out of her like a ferocious summer storm. Bravely, she hit the post button to release her pent-up hurt. Not long afterward, a picture of a homeless, special-needs dog appeared on her timeline. Wanting to know more, she followed the thread to its original post. The more she read, the more she liked this dog. Angela felt both cautious, but excited. She really wanted to adopt this dog! Angela sent a message to the dog’s shelter and told them about her experience with wheelie dogs and gave them a link to Skippy’s Facebook memorial. Not long after that, her phone rang. The caller asked, “Are you really Skippy Johnston’s mom?” It turns out that the people at the shelter were fans of Skippy, and had followed his page for many years! After going through the adoption process, Angela met her new canine friend on February 21, 2016. She and all her wheelie friends threw a party to greet the lucky dachshund. The two of them have been on many journeys and adventures since, and they’ve created many new memories. To this day, Angela is certain that Skippy helped bring them together. Maggie has IVDD, which stands for Intervertebral Disc Disease. It’s a condition any breed or mix of dog can get, but those with long backs are most susceptible. The discs in the spine will bulge or rupture, putting pressure on the spinal cord and damaging it . Dogs will have varying degrees of paralysis, ranging from mild to severe. Some dogs fully recover, some are put down, and the rest fall in between. Surgery is the most common way of treating the disease, but Maggie was not a good candidate. Instead, her rescue group did a wonderful job of getting her many different kinds of treatment, including special medications, laser therapy, swim therapy, and acupuncture. Now, Maggie sees a holistic veterinarian who specializes in a variety of different therapies. 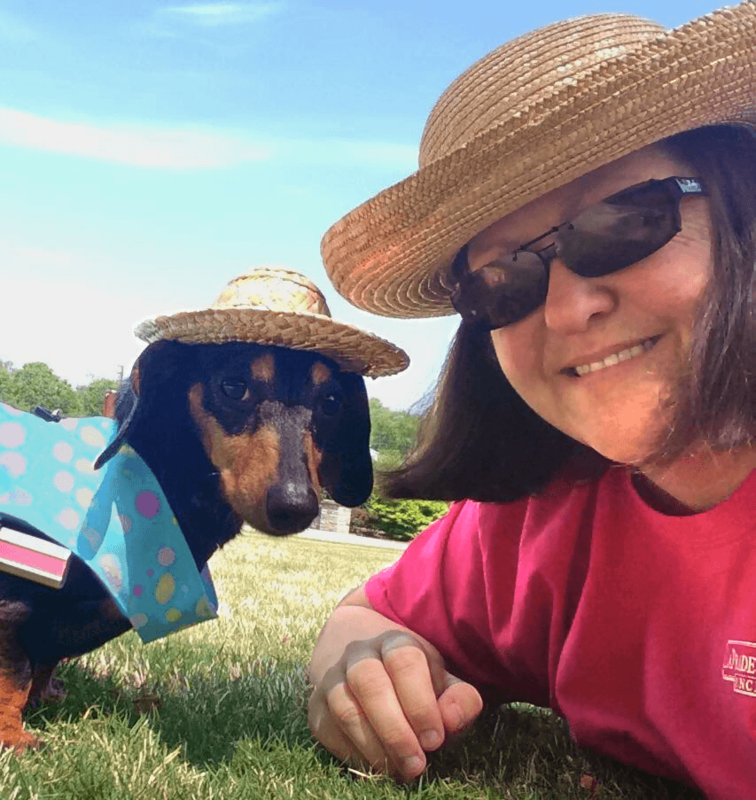 Dogs with IVDD live relatively normal lives, but they do a few things differently. For instance, jumping up and down off the furniture and climbing stairs are huge no-no’s! They can risk rupturing more discs in their back. These dogs may also experience some unique issues eliminating from their colon and bladder, but the situation is relatively easy for the own to handle. Maggie does have a little help moving around with the use of her wheelie cart. This device is a small wheeled cart that attaches comfortably on a dog, making them mobile with little effort. Maggie’s own wheelie cart is pink and fabulous, just like her. She becomes very excited when Angela or Aunt Becky gets the cart out–she seems ready for a new adventure. The cart also helps Maggie move very fast. She instantly becomes a little speeding diva. Out of the many community projects that Angela and Maggie are involved with, their favorite has become The Rescue Dog Olympics. According to Angela, Maggie fell in love with it the first time they went. 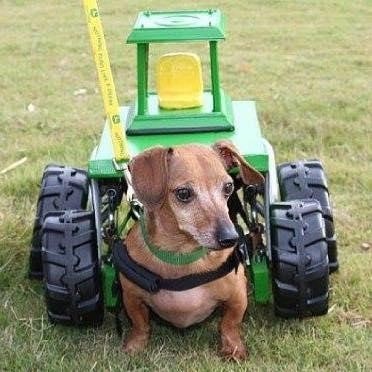 They attended for the first time in 2017 and volunteered as a demo racer for the Georgia Dachshund Races. A few dachshunds came by to try out the track, and Maggie raced with them. She even beat a few of them. Maggie and Angela went back again in 2018 and had a blast. Maggie took her “sweetheart,” Artie, who is also a wheelie dog. 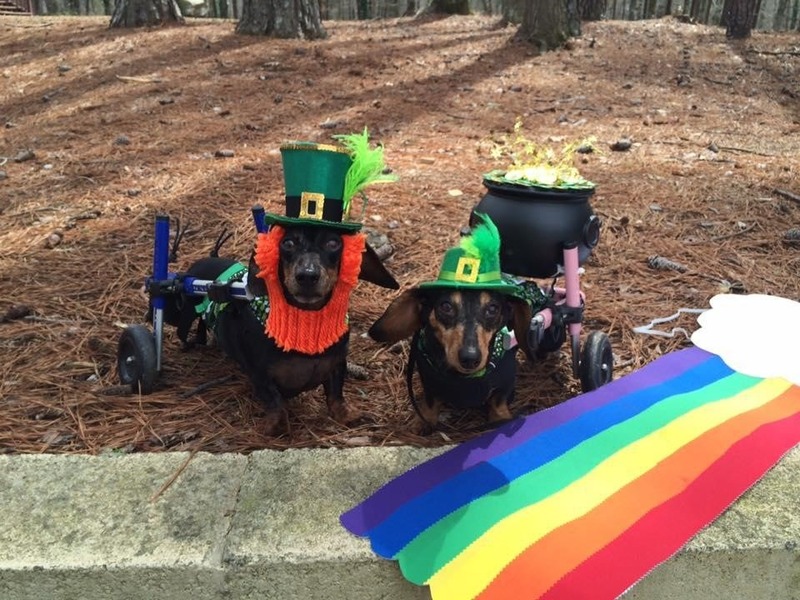 Since The Rescue Dog Olympics was held on St. Patrick’s Day, they dressed up as a leprechaun and a pot of gold. They entered the costume contest and won. Angela and Maggie encourage every dog to get their human out of the house and take them to Rescue Dog Olympics. It’s a great way to have fun, get a little exercise, and show support for all four-legged friends. The next date for Rescue Dog Olympics is Sunday, March 10th, 2019. They also urge everyone who is considering bringing a furry friend into their home and heart to please adopt a rescue. So many different friends out there need a home: youngsters, seniors, big ones, little ones, any breed, any mix, any kind, even ones with special needs. They may be a little extra work, but the love they give is infinite. Allyson Brooks is an author, editor, and graphic designer for Pandahead Publishing. She is also a mom to three rescue cats: Harvey, Ivy, and Decibel. Blog post and Digital Story. Maggie’s story is so inspirational! We’re thrilled to be able to highlight her story.